The archaeological evidence recovered from this site during the last four field seasons all points to a vessel carrying supplies to a colonial outpost. Archival research strongly supports the hypothesis that this site is the sloop Industry, lost May 6, 1764 bringing supplies to the British 9th Infantry Regiment under the command of Major Francis Ogilvie. The Industry was a privately owned vessel, commanded by Captain Daniel Lawrence and was sailing under contract to the British North American Command. The hiring of privately owned vessels to serve the Crown was common practice for the British, and reflects the lack of dedicated cargo carrying vessels on the rolls of the Royal Navy. Tools, grindstones, artillery, small arms ammunition, and agricultural implements all support this initial hypothesis. In the specific case of the iron bar stock, the commonly known presence of a forge in St. Augustine which dates to the early 17th century would certainly explain the large quantities of workable metal aboard the vessel. The primary archival data strongly substantiates this theorem, and given the precise dating from the recovered gun tube (1750-1760), renders a strong case for the vessel lost at site 8SJ3478 to be Captain Lawrence�s transport Industry. 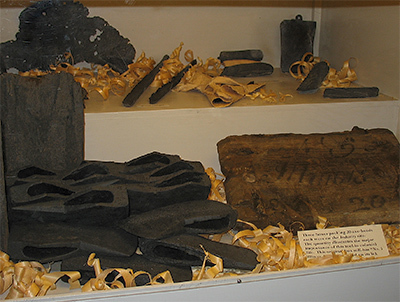 This section of the exhibit presents the archaeologists comments about the artifacts recovered during the excavation.